Blah, blah, blah. Scroll me to the recipe! Call it borek, burek, byurek, bourekas or lakror, they all involve about the same thing: flaky dough filled with meat, cheese, and/or vegetables. Eastern Europe kind of meats the mediterranean in this dish, which is Turkish in origin but has travelled across many borders over the centuries. They can be in pie form or individual pastries, fancified or fancy-free. Either way how do you go wrong with phyllo-filled anything? Use gentle hands when rolling your borek coils to prevent tearing the paper-thin dough. I chose to go with the coiled burek in pie form, because it’s oh-so-pretty. And what’s a good recipe without pretty pictures to go with it, eh? You might have to do a little squishing to get it to fit right, but if you need to do that everything is gonna be OKAY. Some people make their own dough. I do not usually do such things, especially when there is phyllo dough waiting to become a borek in the freezer section of any grocery store. Do keep in mind that working with phyllo dough is a delicate thing; it dries out super fast, so you will want to have a moist paper towel or tea towel on hand to cover up the stack of phyllo as you are rolling each one. It also tears incredibly easily. I think this must be why the packages come with so many sheets in them. When it comes to a phyllo crust, the flakier the better. For this recipe I threw in the last of a container of feta I had laying around. It amounted to about 1/4 cup and the recipe just begged for more. However, the meat/onion mix well seasoned is good enough on its own if feta just ain’t your thang. If you are one of those people like I usually am and just must throw vegetables in everything you do, throw in about 1/2 cup of wilted spinach. This time, however, I wanted to keep it simple. Heat 1 tablespoon of the oil (or 1 of butter, if using) in a pan on medium and brown the meat. Once browned, drain well and remove to a bowl. In the same pan, add the remaining tablespoon of oil and sauté the onions until translucent, about 4-5 minutes. Add to the meat mixture, along with the feta if using. Preheat the oven to 350. Coat the bottom of your baking dish with some of the melted butter using a brush. Unwrap the phyllo dough onto a work surface, and, using 2 sheets at a time, sprinkle about 1/2 cup of the meat mixture onto the dough and roll it up. 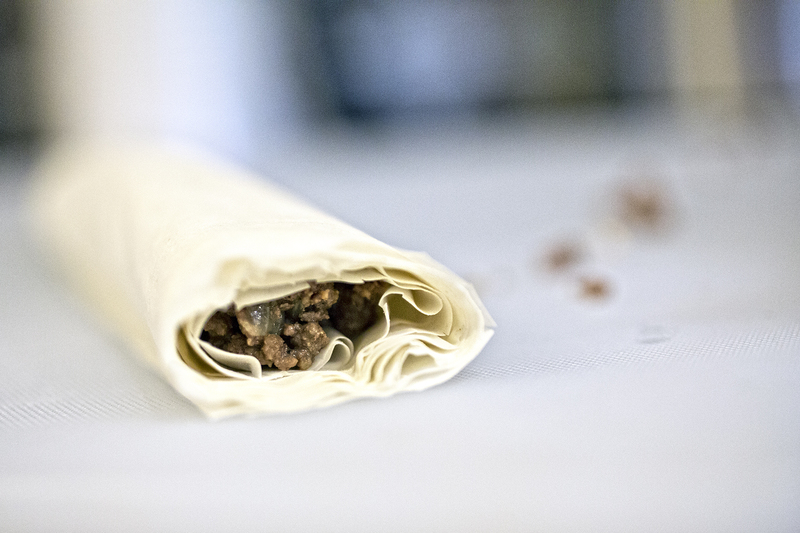 Make sure to keep the unused phyllo covered with a wet paper towel or tea towel as you work. Place the phyllo roll around the edge of the baking dish. Repeat this process, coiling each meat roll towards the center until it's filled. You might have to shift it a little towards the end. Brush the remaining melted butter on top of the borek and bake at 350 for about 30-45 minutes, or until the top is golden and crispy. Serve warm or room temp. Non-game substitution: Most ground meats will do here. As with most mediterranean-based dishes, I suggest lamb. Vegetarian substitution: I’m pretty sure that, vegetarian or not, a cheese-filled borek would kind of be thebomb.com. (In fact, I think I’ve had one. In Turkey. And it was.) You can also fill any borek with seasoned vegetables and/or spinach. 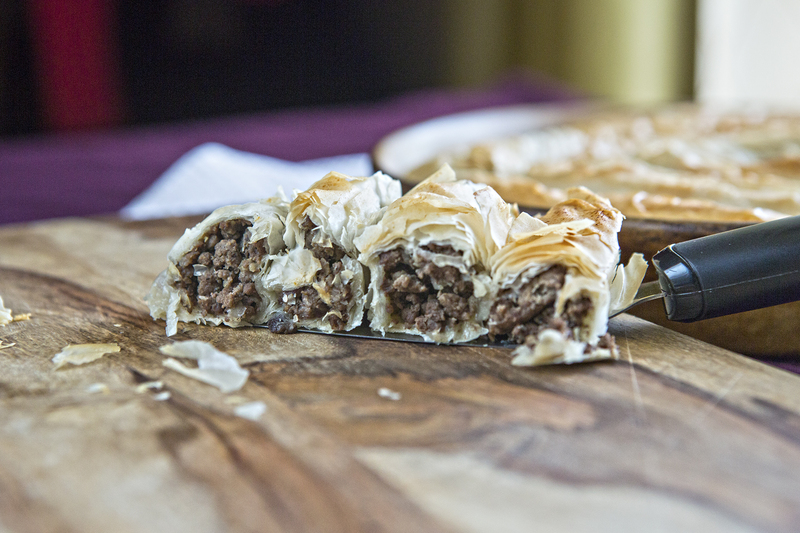 2 Comments on "Wild game recipes: Venison Borek"
Never have I tried a borek before! Thanks for the inspiring post – think I will have to try out the recipe.. but make it vegetarian for myself and my family instead!